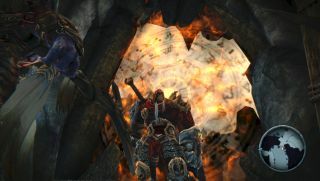 After acquiring the Darksiders franchise following THQ’s collapse in 2013, Nordic Games released a remastered version of its second series entry last year. The rather awkwardly titled Deathfinitive Edition was “just the start” we were told back then, and now an overhaul of the 2010 original is heading our way in October. It’s called Darksiders Warmastered Edition and brings with it a host of improvements, such as: reworked rendering, including better shadows; enhanced texture resolutions; smoother performance - “60FPS in moment-to-moment gameplay”; and 4K support for PC. “Deceived by the forces of evil into prematurely bringing about the end of the world, War – the first Horseman of the Apocalypse – stands accused of breaking the sacred law by inciting a war between Heaven and Hell. In the slaughter that ensued, the demonic forces defeated the heavenly hosts and laid claim to the Earth. “Brought before the sacred Charred Council, War is indicted for his crimes and stripped of his powers. Dishonored and facing his own death, War is given the opportunity to return to Earth to search for the truth and punish those responsible. Darksiders Warmastered Edition is due to launch October 25 for £14.99/$19.99/€19.99.